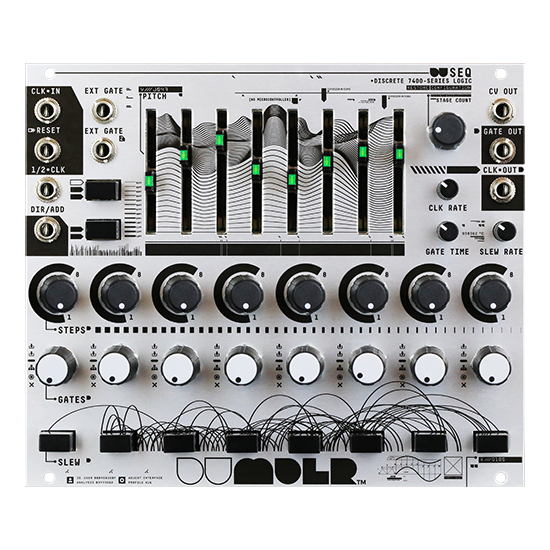 “DU-SEQ is an analog pulsing sequencer with a highly intuitive interface. The 1V/Octave pitch signal path is fully analog, and the gate signal is generated entirely from discrete 7400-series logic (no microcontroller) clocked directly from a built-in clock with tempo and gate width settings, or an external clock/gate signal. Each of the up to eight steps has a two-octave pitch range and can be assigned to pulse or count up to eight times using one of six gating patterns — including two external gate pattern inputs — allowing for a huge diversity of musical possibilities. © 2016 Darkplace Manufacturing LLC.